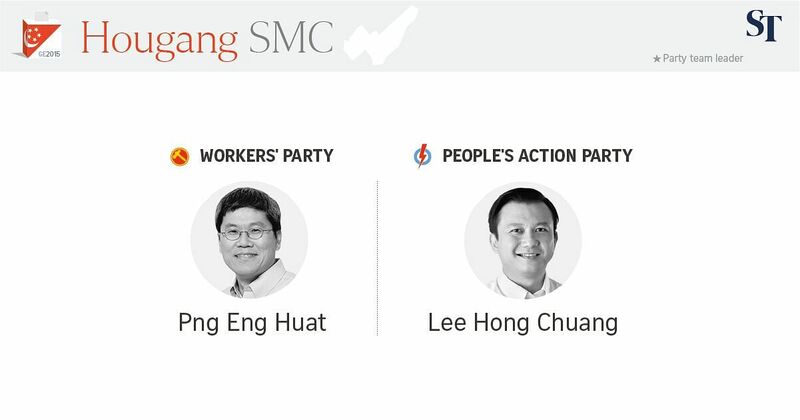 SINGAPORE - The Workers' Party Png Eng Huat will defend Hougang Single Member Constituency (SMC) against Lee Hong Chuang of the People's Action Party in the next election. WP chairman Sylvia Lim confirmed on Sunday (Aug 16) morning that all the opposition party's MPs would be staying put in their respective constituencies. The WP currently has seven members in Parliament - five in Aljunied Group Representative Constituency (GRC), along with Mr Png and Ms Lee Li Lian in Hougang and Punggol East SMCs. Mr Png, 53, beat the PAP's Desmond Choo with 62.1 per cent of the votes at the 2012 Hougang by-election, following his WP colleague Yaw Shin Leong's expulsion from the party. His opponent, Mr Lee, was introduced by Prime Minister Lee Hsien Loong on Saturday along with the PAP's slate for Ang Mo Kio GRC and Sengkang West SMC. The 45-year-old IT manager, who is also the PAP branch chairman in Hougang and the team manager for Singapore's gymnastics team, acknowledged he faced a tough fight to wrest control of a WP stronghold. The single-seat ward has been held by the WP ever since party chief Low Thia Khiang won it in 1991. "I want to tell residents, I'm here to serve you. I'll try my best to gain their trust, get them to understand who I am," Mr Lee told The Straits Times.